Seong-Hoon Cho, a professor and researcher at the University of Tennessee Institute of Agriculture, has been chosen as a Fulbright U.S. Scholar and will spend six months in South Korea, developing the framework for the design of payments for forest carbon sequestration that optimizes risk/reward trade-offs and to help determine optimal spatial targeting of incentive payments to encourage forest carbon sequestration. Photo by N. Leverton, courtesy UTIA. 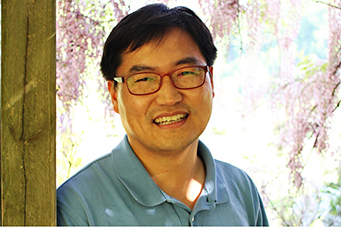 KNOXVILLE — Seong-Hoon Cho, professor and researcher at the University of Tennessee Institute of Agriculture, will spend six months in South Korea, designing the country’s framework for forest carbon sequestration payments that optimizes risk/reward trade-offs. The project, which is inspired by a new USDA-National Institute of Food and Agriculture project that Cho is leading for the next three years, includes designing an innovative framework that merges economics, finance modeling and ecological modeling to help determine optimal spatial targeting of incentive payments to encourage forest carbon sequestration. Sequestering carbon through the reforestation and/or avoiding deforestation is a cost-effective means of mitigating climate change. Cho will design incentive payment programs for forest-based ecosystem services using modern portfolio theory. Information generated from his research will help determine optimal spatial distributions of initial forest carbon credits that can be traded in the carbon market program, should the Korean government decide to adopt forest carbon as part of its new cap-and-trade program. South Korea was strategically selected as a host country to Cho’s research because it faces serious conservation challenges from damaged ecosystem services that have resulted from rapid land development. More than half of South Korea’s population is exposed to dangerous levels of fine dust due to rapid urbanization and dust storms originating in China. His presence in South Korea will also facilitate data collection. In addition to his research activities, Cho will also teach at Korea University, a leading university in South Korea, and foster academic ties between KU and the University of Tennessee. “I am excited to have this opportunity to bring key innovation to South Korean efforts to recover ecosystem services through market-driven approaches,” says Cho. “I think the research component will be particularly valued in South Korean academic circles, as the country currently lacks multidisciplinary research activities focusing on modeling human decisions in the context of natural systems. “The teaching component will also train a knowledgeable workforce to develop and administer the innovative framework that has been lacking in the country,” says Cho. “During the course of mentorship and interaction with students at KU, I will have a chance to recruit quality students who have interest in pursuing degrees and/or participating in programs at the University of Tennessee,” adds Cho. A Fulbright legacy is in the making, as Cho’s father was also chosen as a recipient of the Korean Fulbright Scholarship for graduate studies in America some 50 years ago but did not accept due to a lack of funds to purchase the airfare. More than a half-century later, his son will have the honor of representing the U.S. as a Fulbright Scholar to Korea—with paid airfare and a generous compensation package. Cho is a natural resource and environmental economist in UTIA’s Department of Agricultural and Resource Economics, where he teaches graduate-level advanced natural resource economics and undergraduate/graduate courses in natural resource economics. He is also a faculty fellow in the energy and environmental policy program at the Howard H. Baker Jr. Center for Public Policy. Also serving on the faculty board of UTIA’s Natural Resource Policy Center, Cho collaborates with engineers, economists, ecologists, foresters and geographers as part of the Center’s multidisciplinary, multi-institutional and multifunctional approach to solving natural resource issues in the southeastern United States. Cho’s research includes dynamics of natural and human systems such as ecological and economic effectiveness of land conservation, land-use planning on rural-urban interface, valuation of green space for ecofriendly urbanization, management of urban sprawl, and valuation of ecosystem services and their influences on climate change. The majority of his recent research is funded by the National Science Foundation through its Coupled Natural and Human Systems program and by USDA through its Agriculture and Food Research Initiative program. The NSF-funded research focuses on understanding the costs of establishing protected areas, and the USDA-funded project focuses on designing incentives intended to secure ecosystem service benefits from private landowners more effectively. He currently leads a USDA-funded project that deals with the cost-effective design of conservation subsidies in the presence of market and climate uncertainties using the case study of biodiversity conservation in the central and southern Appalachian region. The Fulbright U.S. Scholar Program offers teaching, research or combination teaching/research awards in more than 160 countries each year. Fulbright alumni include 59 Nobel Laureates, 82 Pulitzer Prize winners, 71 MacArthur Fellows, 16 Presidential Medal of Freedom recipients and thousands of leaders across the private, public and nonprofit sectors. Since its inception in 1946, more than 360,000 “Fulbrighters” have participated in the program.